• Both parents are working or one parent is working in lone parent families. This is defined as earning the equivalent of 16 hours per week on national minimum wage/national living wage, but less than £100,000 per year. This applies for self-employed and zero hour contracts. • Both parents are employed but one or both of them are temporarily away from the workplace on parental, maternity, paternity or adoption leave. • Both parents are employed but one or both of them are temporarily away from the workplace on statutory sick pay. • One parent is employed and one parent has substantial caring responsibilities based on specific benefits received for caring. • One parent is employed and one parent is disabled or incapacitated based on specific benefits. 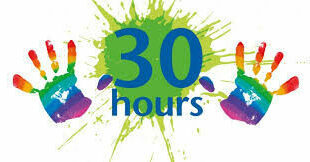 • Grace Period End Date: this is the date up to which a child will be guaranteed a 30 hours place, even if the parent should fall out of eligibility. Grace period end dates will always be the end of term so either: 31 December; 31 March or 31 August.